If you are wondering what the best bulbs to plant in fall are, this is the place for you. I love walking our neighborhood seeing all the beautiful early spring bulb flowers making their way up. It’s so exciting seeing the beautiful flowers that are the first to bloom in the spring. The ones I mainly see are daffodils, tulips, crocus and other bulb flowers. The flowers that bloom in the spring are a feast for the eyes, after a long, cold and dreary winter season. If you are wondering what autumn gardening you can do, that is the perfect time to be planting bulbs in order to have a beautiful flower garden in the spring. 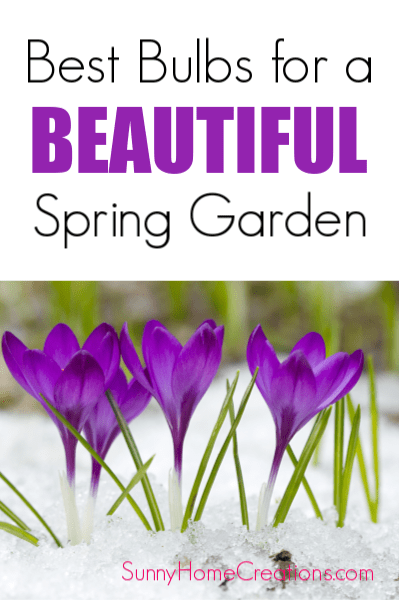 Also, depending on which bulbs you use, you can have your garden unfolding with colors (and wonderful scents) for months throughout the spring season. You can even have the blooming process start before the snow has even melted! There are plenty of options when it comes to the best bulbs to plant in fall for spring flowers. If you think it is only tulips and daffodils, then be prepared to be surprised! These are one of the top bulbs to plant in the autumn. They require no deadheading, rarely do they need dividing and even the deer do not fuss with them. The taller variety of these are the ‘Gladiator’, the ‘Globemaster’ or the ‘Mount Everest’ – these can reach a height up to 4 feet tall with around six to eight-inch balls of florets. These flowers are one of the first few early spring bulb flowers to emerge in the spring season and they work really well in woodlands and along paths. The Alliums may be a bit on the expensive side especially since it seems the larger the bulb, the pricier it is. However, these flowers are ideal for planting in the fall with minimal care and maintenance which makes them well worth the effort of growing and these flowers look great even after they have dried on the stems! Daffodils are one of the distinctive signs that spring is here! They have graceful, trumpet-shaped flowers on beautiful, bright green stems. These flower bulbs are known to be reliable since they come back year after year. Most of the rodents (such as squirrels) generally leave these bulbs alone. When they are planted in masses they have a beautiful effect. Daffodils are also quite versatile and can be grown in almost all types of soil, in the sun or even in partial shade. They can be planted around shrubs and along borders. This large trumpet daffodil mix is a great way to get started growing these in your flower garden. Tulips provide a welcoming variety of rich colors in the spring season with their stunning flowers and they look spectacular when planted along with other bulbs for a mixed effect. These can be grown in any type of soil as long as it is not too dry. This Rembrandt Tulip mix is beautiful and sure to brighten up your yard. Snowdrops are always a beautiful sight when you see them emerging around late winter or early spring, with their ‘nodding’ heads of flowers. They grow into clumps and especially grow this way in the moist soil. They bloom well in shady spots and under the trees. 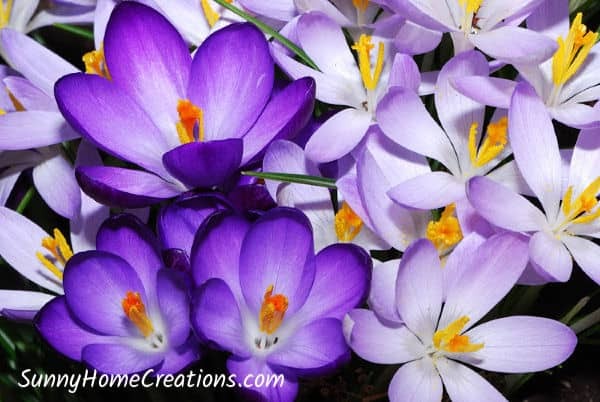 Crocus flowers sprout from the corm as opposed to a true bulb and there are plenty of spring crocus types that you can try. These flowers grow well in sunny sheltered sites that have gritty soil. This beautiful snow crocus mix is sure to look lovely in your yard. Hyacinth are my favorite flower bulb. They generally bloom in late spring. Hyacinths have a strong fragrance which definitely signals spring to me. Make sure to plant them in full sun or part shade. Some of the best varieties of these are Carnegie, Dark Dimension, and Delft Blue. If you want to get a mix of flowers, this fragrant hyacinth mix is great. These beautiful flowers come in different shades of pinks, blues, whites and violets. Back in the day, this bulb was more commonly known as the ‘Squill’, although I’ve always heard these flowers called bluebells. These bulbs are quite tolerant of the shade and they are also one of the early bloomers. These look fantastic in rock gardens as well as when used for edging. This is not a very popular spring bulb even though it is quite a charming little plant. It is however quite well known in the southwest in heirloom colonial gardens. It has a sweet fragrance and the foliage is grass-like which looks great in rock gardens. It does require full sun to bloom. You can find this charming little plant here. Dwarf Iris are dainty flowers on fragile and petite looking plants. They are also one of the early spring bloomers. These flowers have frills and patterns along with their foliage that is grass like and looks quite attractive even after the flowers have faded. Dwarf Iris work well in rock gardens as well as on borders and require part shade to full sun. Leucojum are also known as snowflake. They are pest resistant and naturalize well. Leucojum are able to tolerate different types of soil and bloom well in part shade or in full sun. These “Summer Snowflakes” are delicate and beautiful. Apricot Daffodils are naturally white or yellow, although they also come in apricot, coral or salmon corona (which is the center cup of the flower). 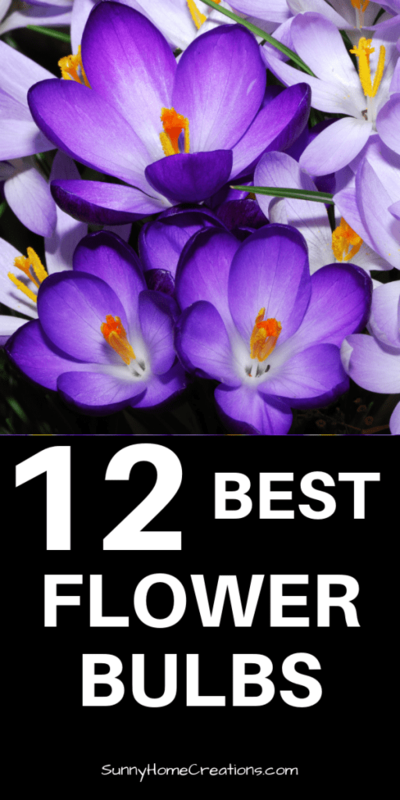 Not only are these flowers very easy to grow but they easily withstand the cold as well. These flowers look beautiful when potted in pretty planters around a space even when there is a modest chill. Dutch Iris have intense and clear color such as purple, deep blue and orange along with a yellow blotch around the petals which drape down the sides of each flower. They look beautiful when grown among low ornamental grasses which give a type of meadow effect. They can be grown in cold climates as well. This Dutch Iris mix is a wonderful assortment of iris’s to get you started. I hope you found some new fall bulbs to plant. Please let me know in the comments below if you have a favorite bulb that I didn’t include. I’d love for you to “PIN IT“.